Hiking tours :: Journey to the most Beautiful Canyons of the "Terskey Ala-Too"
Conditions: There are no technical difficulties on the trekking route, but participants should have good health and fitness, in order to cross 3500-4000m passes, and hike about 7-8 hours each day. Each participant should have warm and water-resistant clothing, coat, trekking boots, sleeping bag, gloves and sunglasses. There are no limits on the weight of personal gear. The region around Lake Issyk-Kul is the most popular territory of Kyrgyzstan. Beautiful mountainous Lake Issyk-Kul (1609m above sea level, length 220 km, width 60 km) - the "blue pearl" has brought fame to Kyrgyzstan and these sights satisfy the most jaded travelers. Our trip follows the Terskey Ala-Too range, which is situated on the southern shores of Issyk-Kul Lake. This is a tour for people who are not interested in lazy vacations, who would like to see hidden places that you would never see if you traveled by car. Day 2. Transfer (400km) to Karakol. Hotel accommodation. Excursion around the city, visit to the Dungan mosque of 1910 and Russian Orthodox Church. Day 3. Transfer to Kashka-Suu gorge where trekking begins. First part of hiking runs through fir forests, then among alpine meadows. After 4-5 hours of hiking we arrive at the foot of Chon-Kol-Dzar pass, having lunch there. Ascent to the pass along a shallow grassy slope about 1-1.5 hours, descent on grassy slope for 30-50 minutes. Further along the path to the Altyn-Arashan River and further on dirt roads to camp. There are no difficulties during this day. Day 4. Easy hiking to Keldyke pass. Path is in the gorge and then up a grassy slope to the pass. Night in tent camp at foot of the pass. Day 5. Ascent to the pass on scree slope. From top of the pass you will see the beautiful Ala-Kul Lake (3,600m, length 2.3 km, width 600-700m) Descent along rocky path to waterfall, then along dry gorge to Karakol gorge. Night in tent camp. Day 6. Hiking to the upper reaches of Karakol gorge and Karakol peak. Path goes through forest and then along wide valleys of the Karakol River. Visit to memorial stone devoted to mountaineers who died in these mountains. Night in tent camp. Day 7. Ascent of Telety pass; easy hiking. First path goes along a dirt road to the confluence of the Telety and Karakol rivers, and then ascent along the river to camp, situated 1km from the pass. Day 8. Hiking to Dzety-Oguz gorge over Telety pass. 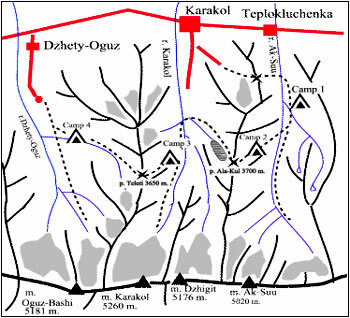 Ascent of pass is along scree slope, decent first across scree slope, then along grassy slope and at the end through fir tree forest to the confluence of the Telety and Dzety-Oguz rivers. Descent is quite long and tiring. Night in tent camp. Day 10. Transfer to Tamga village. Accommodation in guesthouse. Lunch and excursion to Bazaar. Rest. Day 11. Excursion to Barskaun gorge. Hiking to Barskaun waterfall. Return to guesthouse. Day 12. Day of rest in guesthouse. Day 13. Transfer to Boom gorge (185 km) Night in tent camp at the Naryn Bridge. Day 14. Rafting along Chu river (40 km) about 5 hours. Night in tent camp. Day 15. Transfer to Bishkek. Return home. You can alter the duration of your tour and places of visits by adding one of our extensions. Our tour operator will work closely with you or your travel agent to carefully prepare an itinerary based on your stated interests.